Anterior view of the right biceps brachii. The coracobrachialis and cut distal end of brachialis are ghosted in. Permission Joseph E. Muscolino. The biceps brachii attaches from the supraglenoid tubercle of the scapula (long head) and coracoid process of the scapula (short head) to the radial tuberosity and the bicipital aponeurosis. 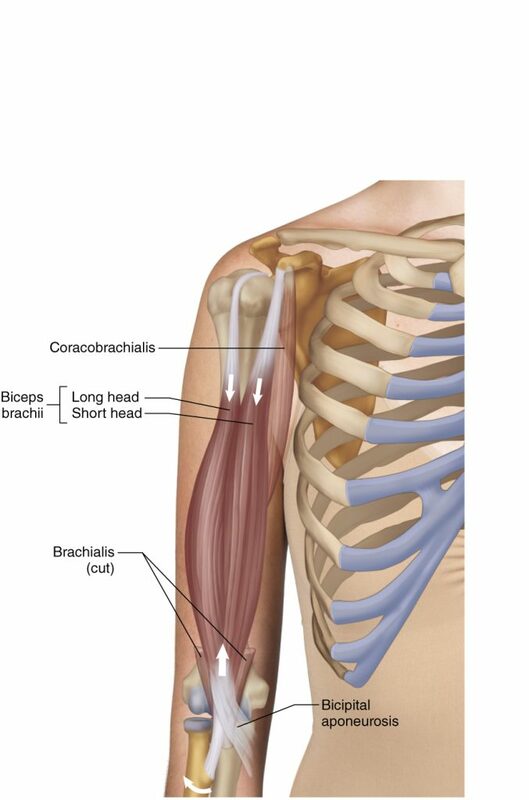 The biceps brachii is one of the three “B”s of elbow joint flexion. The other two are the brachialis and brachioradialis. The distal tendon of the long head of the biceps brachii travels (intra-articularly) through the glenohumeral joint to reach the supraglenoid tubercle of the scapula.